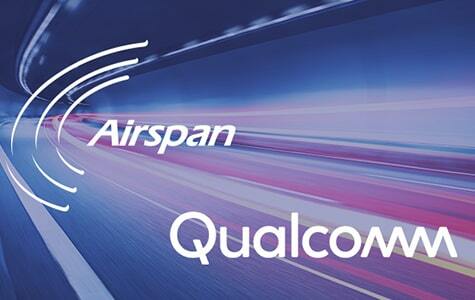 Airspan Networks Inc. is excited to announce today that they will be expanding their cooperation with Qualcomm Technologies, Inc., a subsidiary of Qualcomm Incorporated, to include the development of 5G NR mmWave RAN solutions, leveraging the Qualcomm FSM100xx 5G Platform. This comes in the wake of the joint multi-award-winning success in 4G for the Sprint Magic Box and Reliance Jio’s ground-breaking ultra-dense Greenfield network. Airspan has deployed close to half a million small cells worldwide based on the powerful Qualcomm FSM99xx Small Cell Platform, leveraging its advanced feature sets. Airspan has been able to deliver on the promise of 4G small cells to improve indoor and outdoor wireless network capacity and coverage, increasing macro network efficiency and revolutionizing TCO. Airspan is developing 5G RAN solutions, in both Sub-6 GHz and mmWave bands to meet the wide range of challenges experienced today by mobile operators. The products will feature advanced technologies including Massive MIMO and will support fully integrated architecture as well as distributed V-RAN architectures. “We are looking forward to extending our fruitful cooperation with Qualcomm Technologies, Inc. in the 5G arena. By using Qualcomm Technologies’ cutting edge 5G technology, we will be able to bring the next generation of highly-capable infrastructure products to market,” said Eli Leizerovitz, Head of Products, Airspan Networks. “Operators are looking for a variety of 5G solutions which will allow them deployment flexibility from “All-in-One” to split 7. Airspan’s 5G solutions are designed in a modular way that allows support for all split architectures, for both Outdoor and Indoor use cases”. “We are excited to extend our cooperation with Airspan to develop 5G infrastructure products that will offer operators the flexibility and performance needed to fully realize the potential of next-generation 5G networks,” said Puneet Sethi, senior director, product management, Qualcomm Atheros, Inc.
5G is expected to bring about billions of connected devices that will shape the networks of tomorrow. Networks will need to keep pace by supporting high-speed enhanced mobile broadband and ultra-reliable, low-latency mission-critical communications. Airspan’s 5G solutions will support operators and spectrum holders to monetize the boundless possibilities of 5G.